Organised by the Campaign against Climate Change with the School for Oriental and African Studies (SOAS) Department for Development Studies. Taking place at the central London Universities - SOAS, the Institute of Education (IOE) and University College London (UCL). Opening plenary in IOE, Thornhaugh Street off Russell Square, Russell Square Tube. Map here. Rio to Rio: 20 wasted years? The global surface temperature has risen by 0.38C. The Arctic sea ice has decreased by 2.94 million square kilometres. The CO2 in the atmosphere has risen by 35.19 PPM. 30 661 900 hectares of Brazilian forest have been lost. More than 431,215.08 million tonnes of CO2 have been emitted. The amount of CO2 emitted per year has risen from 21,421.45 to 30,398.42 million tonnes. A wide range of workshops and seminars - and an exciting main plenary - are planned. and more workshops on Green growth vs De-growth, bioenergy and land grabs, forests and biodiversity, aviation, geo-engineering, oceans, Zero Carbon Britain by 2030, arctic methane time bomb, generational justice, climate refugees, civil disobedience, “fracking”, population, gender and climate change, false solutions, TREC: energy from the deserts, …and more. John McDonnell MP (Labour), Jean Lambert MEP (Green Party). Fiona Harvey (Guardian correspondent), Jenny Jones (Green AM & Mayoral candidate), Aniol Esteban (New Economics Foundation), Derek Wall (Green Party/Green Left), John Stewart (chair Airport Watch, HACAN etc) Stephen Tindale (ex-Director, Greenpeace), Oliver Tickell (author Kyoto 2), Mayer Hillman, Mel Evans (Platform), Prof Peter Mollinga (SOAS), Hannah Smith (COIN & Refugee & Migrant Climate Forum), Deepak Rughani (Biofuelwatch), Murad Qureshi (GLA & Bangladeshi community), John Lanchberry (RSPB), Rich Hawkins (PIRC), David Powell (Friends of the Earth), George Barda (Occupy LSX), Centre for Alternative Technology, World Development Movement, Action Aid, Native Spirit Foundation, UK Tar Sands Network, David Wasdell (Meridian Project), Andrew Lockley & Tim Kruger (on geoengineering), Suzanne Jeffrey (CCC Trade Union Group), Paul Mobbs, Debi Wagner (US Citizens Aviation Watch via skype), Chris Baugh (assistant General Sec Public & Commercial Services Union), Peter Challenor (National Oceanography Centre), Tony Kearns (assistant General Sec Communication Workers Union), Speaker from the Eradicating Ecocide Campaign, Gerry Wolfe (TREC-power from the deserts), Frans C.Verhagen (US Aviation Watch via Skype on Green Economy), Muzammal Hussain (Wisdom in Nature), Susan Roaf & Fergus Nichol (on built environment), Terry Reintke (co-spokesperson FYEG- Federation Young Euro- Greens), Miguel Angel Diaz (National Coordinator Joves d'Esquerra Verda, Catalonia), Melanie Strickland (Wild Law, Occupy), Daniel Scharfe (Greenspeed) …and many more invited. Check http://www.campaigncc.org/altsummit for updated details. FILM SCREENING ‘Maedchen in Uniform’ (Leontine Sagan 1931) SUN 20:00 JESUS COLL. Revolution in the Arab world, controversies over nuclear power, neoliberal cuts across the globe, and uprisings from Wisconsin to Westminster set the scene for this year’s Oxford Radical Forum. Once again Wadham College – and other venues – will play host to a broad range of critical debates and discussions on the radical left, with leading speakers, commentators, activists and academics. Solving the Ecological and Environmental Crises. The Campaign against Climate Change, working with academics, climate activists, the TUC and several UK trade unions has produced the report One Million Climate Jobs. The report calls for the government to create one million green, climate jobs in the face of rising unemployment and the need for urgent investment into renewable energy. Mike’s Letter from America: Wisconsin rising. The ruler has given himself powers described by his critics as ‘dictatorial’. He is attempting to virtually outlaw government workers’ unions, and threatens to use troops against strikers. Opposition leaders have fled across the border and gone into hiding. Tens of thousands of protesters are camped out in the capital city. No, this is not a Middle Eastern despotism. This is Wisconsin, in America’s Midwest. The ‘dictator’ is not Mubarak, Bin Ali, or Sheikh al-Khalifa – it is Republican governor Scott Walker. This week, he announced big increases in public employees’ pension and health insurance contributions (equivalent to a 7% pay cut), and proposed legislation that would ban collective bargaining for most state workers on anything but base pay. In other words, all but the most minimal right to unionize would be stripped away. To top it all, he has threatened to deploy the National Guard (the state militia) if public sector workers go on strike. To be poor, a leftist, a trade unionist, woman or a minority is to feel like a punch-bag right now, as a vengeful hard-right Republican Party pushes its pet projects in Congress and the state legislatures. Fortunately, the people of Wisconsin do not share the pessimism and feeling of powerlessness that afflicts much of the American left. Day after day, thousands of union members and their supporters have poured into Wisconsin’s capital, Madison, and laid siege to the Republican-controlled state legislature as it has tried to push through the anti-union law. As of Wednesday (Feb 16), 30,000 people were in or outside the Capital building. http://www.youtube.com/watch?v=ivYnS6DcFUA&feature=youtu.be; http://www.nytimes.com/2011/02/17/us/17wisconsin.html?_r=1. Responding to the pressure put on them by the protestors, Democrats in the state senate walked out, denying the Republicans the quorum needed to pass the law. Then events took a surreal turn, as the Democratic senators left the state for ‘a secure, undisclosed location’ to avoid being tracked down by state police and ordered to return to the senate. Parallels with the revolution in Egypt have not been lost on anybody. 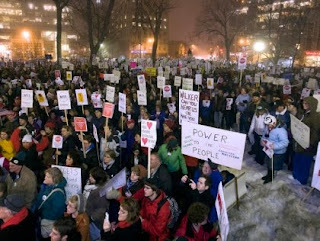 Republican congressman Paul Ryan called the peaceful protest a ‘riot’ and complained that ‘Cairo has moved to Madison’. Protesters have carried Egyptian flags, sung ‘march like an Egyptian’ and called for the overthrow of ‘Hosni Walker’. Reports on TV and social media reflect the sense of excitement and self-empowerment among the protestors. Teachers in Madison, defying threats of the sack, phoned in ‘sick’ and descended on the Capitol, forcing the city’s schools to close. Hundreds of school and university students have also walked out. Members of unions unaffected by the ban – notably the fire fighters – have joined the protests regardless, understanding that this is an attack on all unions. Another echo of Cairo can be seen in the totally peaceful nature of the protests, and the impressive level of solidarity and self-organization. Websites and social media pages representing the protesters are full of requests for – and more importantly, offers of – support, food, water, blankets, warm clothes etc. While the protesters have stopped short of storming the senate chamber, they are essentially in occupation of the Capitol. The backdrop to these events is an all-out Republican assault on anything even vaguely progressive. The Mid-term elections saw a landslide - albeit on a very low turnout – for the Republicans, not only in Congress, but also in state legislatures and governors’ mansions. The recession has left both the federal and state governments with huge debts, and the Republicans – now dominated by the far right– are using this as an excuse to attack everything that smacks even vaguely of socialism, from Public Broadcasting (funding threated with the axe) via Planned Parenthood (funding cut off) to the unions. The pattern is repeated across the country – in my home state of Michigan, the new Republican governor just announced $180 million in cuts in public sector pay, just after commissioning a rigged survey that claimed (wrongly) that public employees are better paid than workers in the private sector. The assault on public-sector workers is not just (or even mainly) about cutting spending, it is an attack on a highly unionized part of the workforce. The Wisconsin protesters have dubbed Madison ‘Ground Zero for the labor movement’, and they are not exaggerating – the stakes are that high. If Walker succeeds, this will be a massive blow to the basic human right to organize unions. However, the huge and rapid groundswell of opposition was clearly the last thing the governor expected. The Republican union-busters have been completely wrong-footed, and the Democrats who have been happy to accept union support while offering nothing in return have been forced to find a backbone. Events in Madison have captured the imagination of the whole movement across the United States, as the deadening feeling of pessimism that has hung over the left since the Reagan era is lifting like fog on a sunny morning. Maybe we are being too optimistic, maybe this is just a last, glorious, defiant gesture. But I don’t think so - it looks and feels like a turning point. The fight-back starts here – the American working class is back. Just under 60 people came to the recent Oxford launch meeting for the One Million Climate Jobs booklet, including local climate activists, Green and Labour councillors and trade unionists. The meeting linked up the economic argument for creating jobs and the devastating cuts proposed in local youth service provision and discussed ways to further spread the climate jobs message. The meeting recieved radio air time and has struck a chord with several local union branches who have ordered copies of the booklet. A film about the campaign is being sponsored by the local UNITE branch and will be available shortly. You would think they’d be delighted; in the tenth year of the ‘War on Terror’ (a war which Barack Obama continues to wage, even if he never calls it by that name) democracy, as promised by the neo-con ideologues, just might be spreading throughout the Middle East. However, the uprising in Egypt has been greeted by American politicians and media at best with ambivalence, at worst with condemnation. The Egyptian Revolution is world news, and has (I hope!) been adequately covered by the British media, so I am not going to spend a lot of time explaining what is probably obvious – that democracy promotion and ’regime change’ from below was never part of America’s plan, and that Egyptian dictator Mubarak is a key-pin of the whole US strategy in the Middle East – a strongman who has kept leftists and Islamists under his thumb, and who has played a crucial role in enforcing the Israeli blockade of Gaza. Instead, I want to focus on the reaction of the media and politicians here in the US, to show just how wrong footed they have been by events in Egypt. First, take Glenn Beck - please! (This joke was stolen from a papyrus found in an Egyptian pyramid). This Fox News host has become the unofficial mouthpiece of the Tea Party movement, and by extension of the Republican right. His angle is to hysterically proclaim the Obama administration a threat to freedom, and to accuse opponents of being communists or Nazis (or usually both). So faced with an actual dictator, you would think he would be delighted at the prospect of his removal by people power? Not a bit of it; he explained to fellow Fox News pundit Bill O’Reilly that the movement in Egypt was being run by Islamists and communists. (Communism, in the Stalinist sense of the word, today only exists in two places – North Korea and Glenn Beck’s imagination). According to Beck the ‘radical left’ in the US and ‘Islamic radicals’ are plotting nothing less than ‘the destruction of the Western world.’ I had no idea the American left was so powerful. Given their Islamophobia, it is perhaps not surprising that Beck, O’Reilly and co should cheer on somebody who is killing Arabs, even if that person is an Arab himself. In the more mainstream news media, the tone has been less pro-Mubarak, and more ‘what’s in it for us?’ Never mind the Egyptians dying at the hands of Mubarak’s thugs; how will this affect oil prices? So-called foreign policy experts have reminded us that Mubarak has been a source of stability, a friend of Israel, and a bulwark against radical Islam. The strategic significance of the Suez Canal has been mentioned so often you would think it’s 1956. More importantly, Obama and his administration were less than enthusiastic about the outbreak of democracy in the Middle East. 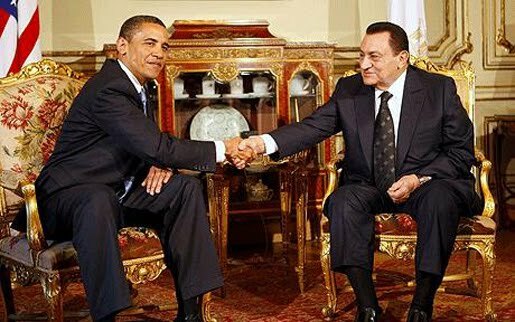 We don’t know what deals are being cut right now between Obama and Mubarak, but it appears that, now they see which way the tide is flowing, the US government wants to ease Mubarak out (preferably in favour of his former intelligence chief, Vice President Omar Suleiman. The Americans know him well from his cooperation with CIA’s ‘extraordinary rendition’ torture program).Their initial response was very different, however; Vice-President Joe Biden said “Mubarak has been an ally of ours in a number of things… I would not refer to him as a dictator.” Hillary Clinton also saw stability as more important than democracy; she made the curious statement that the US had backed democracy in Egypt for over thirty years (the same thirty years that Mubarak has been in power), and has talked only of an ‘orderly transition’ in power. As for vacillator-in-chief Barack Obama, while he has begun gently suggesting Mubarak should go, he has done his best not to put any real pressure on him (such as threatening to cut off the 1 billion-per-year military aid he receives from the US). Maybe he is keeping quiet for fear of drawing too much attention to his and previous US presidents’ friendship with the Egyptian dictator? Type ‘Obama Mubarak’ into a Google images search and you will get over 85 million results. Finally, one important fact has been missed by nearly all the US media; the upheavals in the Arab world are as much about bread as they are about democracy. When Hillary Clinton talked of the people of the Middle East wanting ‘economic freedom’, she forgot that it has been economic ‘freedom’ in the form of neo-liberal policies that sparked the rebellion in Tunisia, which began with the suicide of an unemployed man. This is the same economic philosophy that has been destroying the livelihoods of American workers for the last thirty years. Compare Egypt with the USA; one is a sham democracy dominated by a corrupt wealthy elite, with growing poverty, inequality and social divisions. The other has pyramids. Oxford Left Alternative provides regular updates on left campaigns and events in Oxford. It was established in 2006.